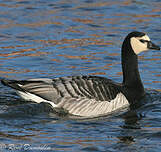 The Barnacle Goose is a small goose easily identified by its black neck and chest, pure white small head, grey striped back contrasting with a very pale underpart . 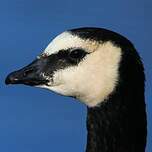 There are some similitudes with the Canada Goose, but the latter has a longer neck. 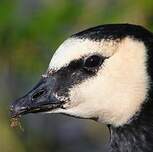 Also, the Canada Goose has a pale or brown chest, never black. 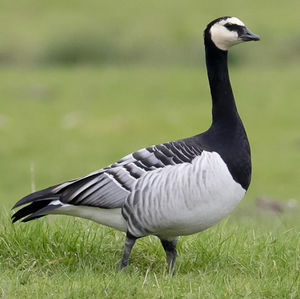 The Barnacle Goose has a small triangular black beak, black legs and a white rump. 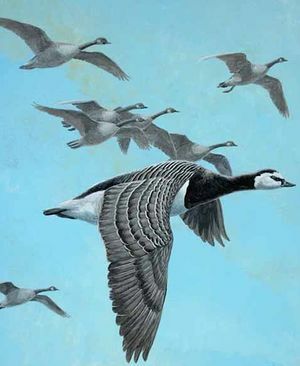 In flight, wings look wide. Its call is raucus and short. The grey grey sound follows very quickly. In group, they have a high-pitched hogoog hogoog talk mixed with higher calls that sounds like a dog's pack yelp. 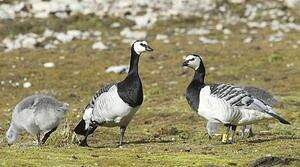 In summer, the Barnacle Goose frequents cliffs and the mass of fallen rocks of arctic islands. 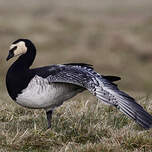 In winter, it lives in flooded meadows and coastal marshes, maritime bays low banks and mud flats at low tide. 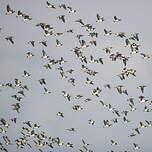 Three main groups, respectively coming from Greenland, Spitzberg and New Zemble start their migration end of August or beginning September. 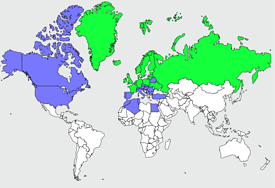 They never mix and land on Scottish, Irish, and UK west coasts. The third group arrives on German and Netherland shores. 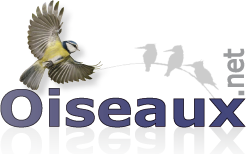 In France, the species is normally very rare, limited to a few dozens of individuals found in the Somme and Mount Saint-Michel's bays. 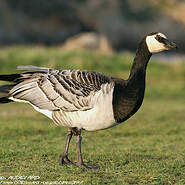 During very cold winters, number of individuals may reach an amount of 8000, found in a larger area, including all coastal bays and estuaries. 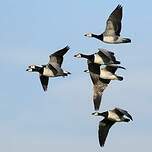 Barnacle Geese fly in compact groups. 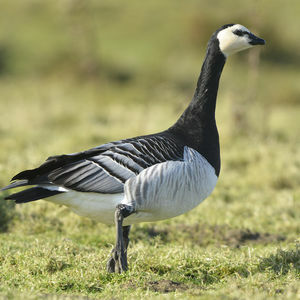 As well as barnacles and geese in general, the Barnacle Goose is mainly vegetarian. Grass is its main diet, although during summer, it can eat various maritime plants shoots. In winter, when grass is not as dense, Barnacle eat also seaweeds, aquatic insects, molluscs and shellfish. 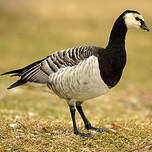 The species eats anytime during the day and prefers the coastal zone grass, regularly flooded by water. If it's not possible, it turns off towards the meadows behind the coast. Nidification season starts soon after returning in the Arctic. 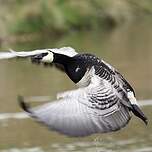 During the courtship display, the couples leap, stretching their neck and flapping their wings. They call loudly. Every bird chooses its partner for the season. 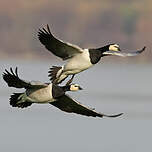 Some birds remain in couple all life long. 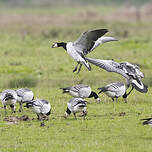 Barnacle Geese gather to nest in colonies. 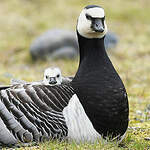 The nest, built mainly with vegetal materials and lined with down, is placed on a cliff's ledge, an islet close to the shore or directly on the tundra. The nest site is sometimes shared with guillemots. The female lays three to five eggs and sits on them for 24 to 25 days while the male is guarding it watchfully. The altricial fledglings are very active as soon as they hatch out and are ready to fly 40 to 45 days after. 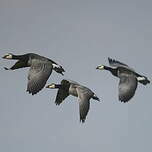 The family group remains together during migration and wintering. 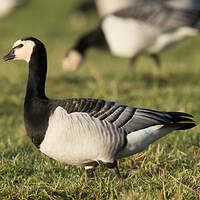 Conflicts with farmers is a common problem in wintering places. A shooting licence has been in place until very recently.